It's been a busy week of sewing. 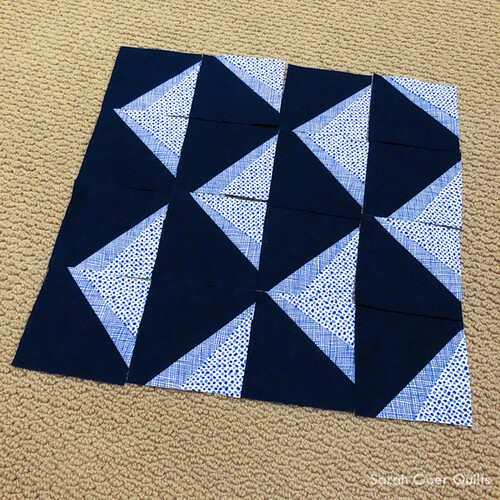 Curves and Swoon blocks and Project QUILTING, oh my! I mentioned this week's Project QUILTING challenge to my daughter and she made a quilt for the challenge, too! I'm so proud of her and really enjoyed her excitement. This week's challenge was to make a quilt with only red, white, and blue (though we didn't have to use all three). I love the fairly open ended theme and endless possibilities. Early on I decided that I would limit to blue and white since I don't have much in the way of red fabric. 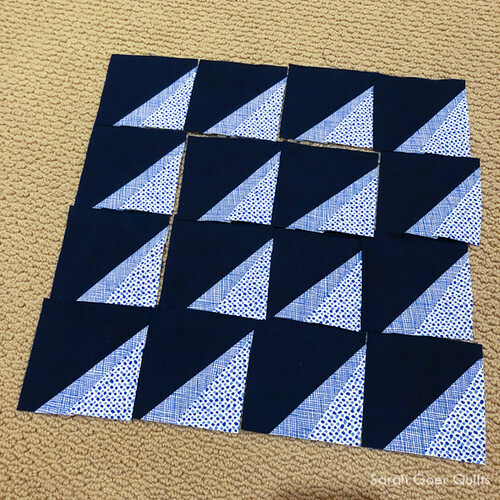 I've admired these temperature quilt blocks by Cheri and decided on some improv triangles for this challenge. 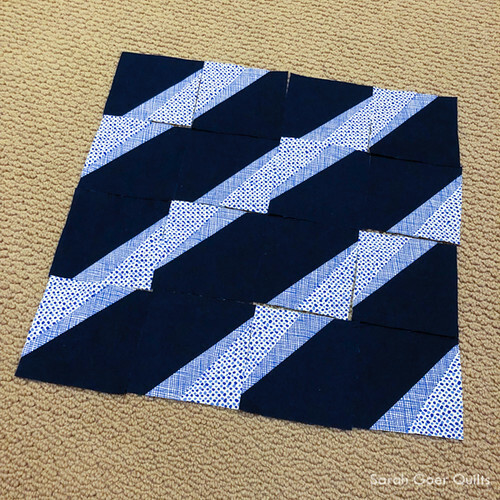 I chose a dark blue solid for the main portion of the blocks and was able to cut sixteen 4" squares from my scrap of fabric. Of the two coordinating prints I chose, I was most limited on the crosshatch, so those were cut into small strips. The units went together quickly. My initial plan was to use a straight set layout with all blocks in the same direction like this first photo. Then I played with potential layouts and decided I'd go with the fourth one. In piecing my rows together two rows got switched and I didn't realize it until I was done with the quilt top. With the other deadlines this week I decided I didn't have time to unsew and I would just stick with the happy accident that happened when I swapped rows 3 and 4. 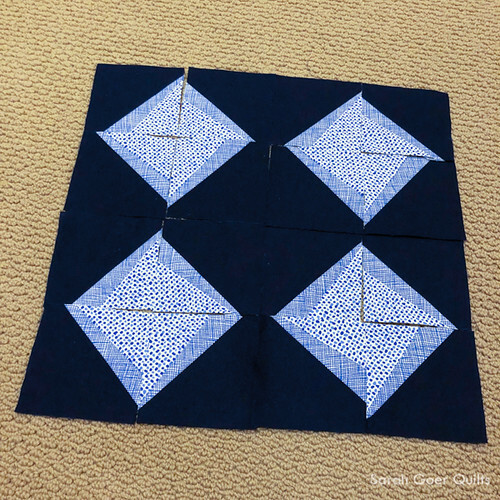 I went simple with the quilting by using Aurifil 50wt Medium Delft Blue (#2783) for diagonal walking foot quilting. My final design decision was to bind in solid Kona Red. My daughter and I both used this fabric for our binding, so that saved me some time by making it all at once. The quilt was machine bound with Aurifil 50wt Red (#2250). Since I pieced with Aurifil 50wt White (#2024), I not only used red, white, and blue fabric for this quilt, but also red, white, and blue thread as well! The quilt finished at approximately 15" x 15". 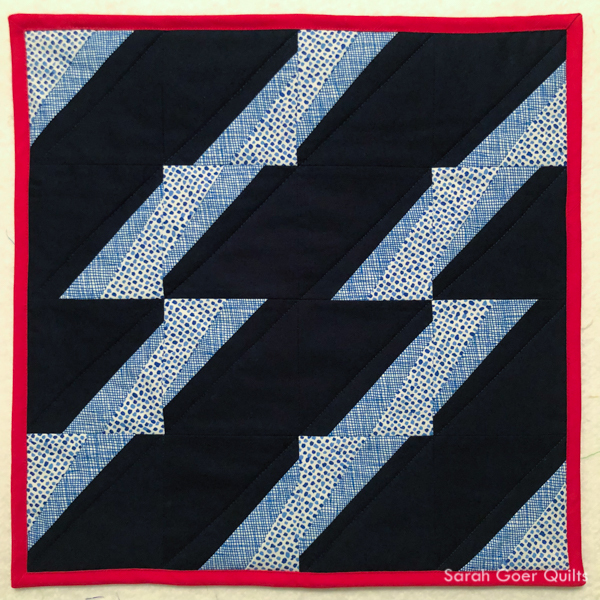 I'm linking up to Project QUILTING 10.2. 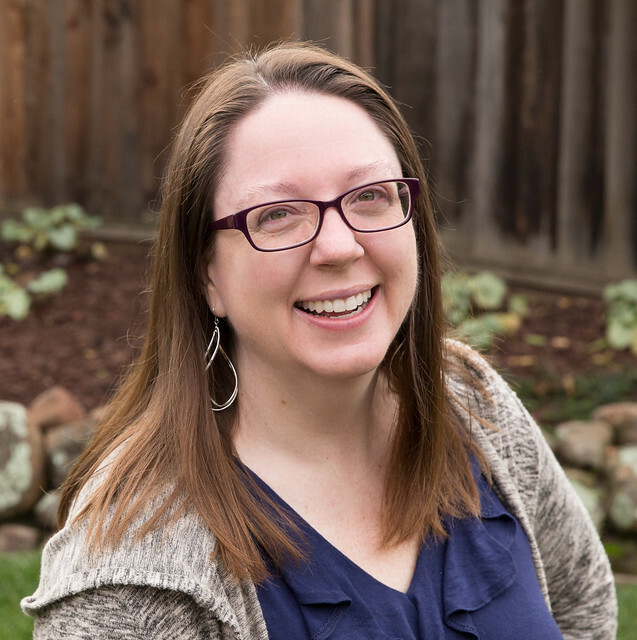 Voting is open! You can vote for your ten favorites. Mine is #74 and my daughter's submission is #72. Posted in Quilting. 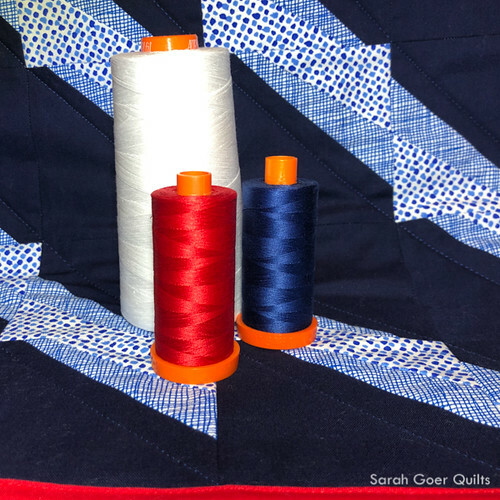 Tags: Aurifil Artisan, Aurifil thread, challenge quilt, finished quilt, mini quilt, Project QUILTING on January 27, 2019 by sarah. I love the happy accident - so much fun to accept what happens and go with it - not to mention practical, too! Sometimes it's harder to accept therapy accident when they are precise, traditional blocks, but I think that's one of the benefits of improv. Thanks for visiting, Kathleen. It's great. Even with the happy accident. Well done. Did you have a "pattern" for the wonky triangles, or just improv? Thanks, Anja! They are improv. I think they ended up pretty regular since I had a very limited amount of the crosshatch. Easiest to tell in the first picture that there are variances, I think. Love this Sarah. Fun to see all of the various layouts - what a different look happens with each one. Great finish! Especially considering you worked with your daughter on hers as well - it is such a gift to her, giving so much of your time so she can quilt too. Good job mama!! Aww. Thank you, Bernie. I was willing to sacrifice my finish to help her get hers done. In the end I sacrificed sleep to get mine done. Only two nights up until 2am. ;-) I think I need a nap today. I have to admit that the finish with the red binding surprised me and I like it's unexpected arrival and use at the end of the project. Thank you, Yvonne. I told a friend before I put it on last night that I wasn't sure if it was the right choice, but the binding was made so that's what was going on. I'm still not sure about it, but it was fun to work in the third color. Aww. Thanks, Kim! Thank you for hosting. It was a whirlwind week making two in our house, but I'm thankful for the Project QUILTING challenges.